While all packaging tables are similar in function, every packaging bench is unique to its own set of issues. Sometime even within a packing and shipping department, the workstations vary because of the size and scope of the packaging operation. The following information will help guide the process of designing a packing bench model. What are the 6 Steps to Designing an Efficient Packaging Station? Write a job description for your packaging bench. Determine a workflow pattern for the packing table. Create a plan for integrating the packaging workstation into the material handling system. Make a detailed list of equipment and materials to be stored at the pack bench. Design a packaging bench model. It is a common error to focus the packing workstation design solely around the storage of supplies. Maximized efficiency comes from integration of the pack station into the company’s order fulfillment and material handling systems. Looking at the order fulfillment plan, from the point of view of the packaging function, creates additional efficiency and productivity by reducing extra movements, eliminating duplicated tasks, and handling the product fewer times. It also determines logical ways to organize the most important packing materials and supplies. Consolidate Orders: If this is one of the Packer’s tasks you must allow table space for this process. Check Line Items to Packing List: This process requires space for writing or a computer. Quality Control: If damage is detected, what happens to the item? How will it be replaced? How will the replacement process be initiated? Where will the partial order be staged until the new item is received? Protect and Pack Function: What steps are necessary to complete the packaging process? Address and Label: When, where and how will this process be completed? Staging and Transportation of Packed Orders: How will packed orders be staged? How are packed orders moved to shipping? Select the combination of functions that apply to your packing bench and proceed to Step 2. Defining the operational flow gives you an overview, so you can consolidate and condense all the functions into an ergonomic working model. Properly designed, it will reduce wasted movements, eliminate extra handling of the product and show you where to store all the equipment and supplies. The most efficient packaging systems are usually arranged in straight-line flow patterns. This allows the packer access to the orders on one side of the table. A section of tabletop is allocated to consolidate and check. The rest of the table top space is free to place items in the box, void fill, close, label and manifest the box. Off table space is provided to stage or convey the packed carton to shipping. *In larger more complicated applications flow patterns get more complicated. After you complete the flow outline go to Step 3. The Packing station has 3 primary interfaces with the company material handling system. In typical applications, orders are transported via boxes, totes, skids, carts, and conveyors or in very large applications carousels or sorting systems. It is most efficient when orders are delivered to the packer in batches, so the packer does not have to move from his workstation. The delivery system should be located next to the table. To maximize efficiency, the packer should always be within easy reach of a new order. All Packing benches need to be re-supplied with materials. If possible, the packer should not have to stop while fresh supplies are placed on the bench. In many cases, the restocking can take place from the back of the table or by simply using portable supply carts, which can be wheeled up to the table. Every application is different, but a creative approach to this issue can save significant time. Packed orders are usually staged on skids or carts or are transported away from the work area by conveyor. Whenever possible, these systems should be next to the table so the packer does not have to lift, carry and walk the carton to the staging location. Many times the boxes can weigh 40-70 pounds. Continuous lifting and handling increases the chances for back and shoulder injuries. OSHA publishes a complete specification on Range of Motion Standards. It is a good idea to become familiar with the Standards to avoid problems. The best solutions allow the packer to simply push the packed carton onto the staging area. Spur conveyors, table height carts and conveyors make this possible. Lift tables allow skids to be regulated to table height. Review your system to determine how to interface with your normal materials handling functions. Document your plan so all of your employees understand the process. When this is complete move to Step 4. The functional design of the packaging table is usually related to the type and volume of supplies and equipment to be stored. Break your list into three parts. Make sure the list is complete and detailed with number of sizes, measurements of boxes and envelopes etc. When these tools are a part of the system, they have to be readily available when required. Often these items may be required during the packing operation. Storage space needs to be provided. After completing the list, rank each item using the ABC concept. “A” items are the supplies most frequently used. ”B” items are less important and “C” items, are used infrequently. This rating will help determine where each supply will be stored on the table. When the first 4 steps are completed you are ready to document your Packing methods, procedures and strategy. This process is literally a detailed walkthrough of the entire packing cycle. It is suggested you simulate a mock up of the table, placing it next to the simulated picked orders storage. Step-by-Step walk through each function following the flow pattern you created in (Step 2). The object is to move sequentially through all the functions using a minimum amount of time, motion and material. Document each movement so it can be easily reviewed to find more efficient methods. Finally let your workers be a part of the process. It is great for morale and usually they are very innovative. Most importantly, if they are a part of the process, they are less likely to fight it. Step #6: Designing the Packing Bench - How Do I Store All These Supplies? The volume of equipment and supplies you must store may surprise you. Following are some suggestions and rules. Rule 1. Do not use the table surface for storage, if possible. Rule 2. Incorporate ergonomic movement standards into the design. Rule 3. Locate the “A” items in the easiest to reach locations. Rule 4. Efficiently utilize the space surrounding the packing station. 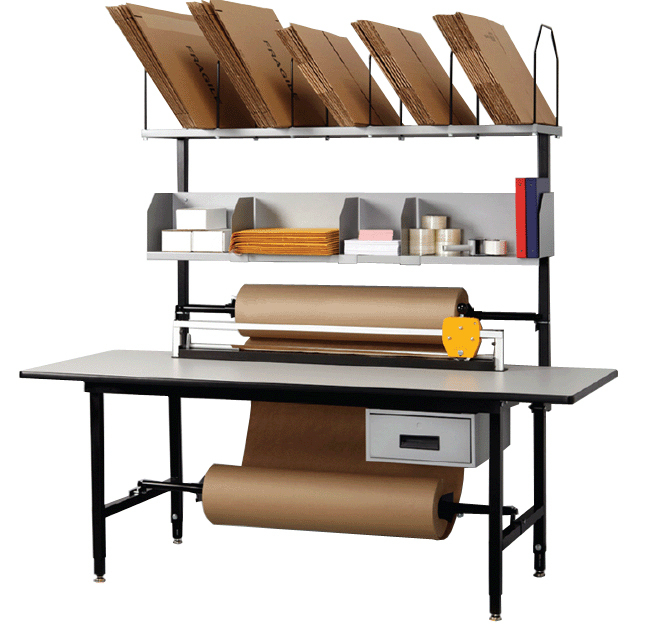 There are five locations around your packaging workstation to store and organize materials and supplies. Normally all the material cannot be stored in the front of the bench. The “B” and “C” rated materials can usually be stored below the top, on the sides or behind the worker. In multiple workstation areas these materials can often be shared. This is the prime ergonomic storage space and is usually used for the highest “A” rated items and equipment. Under the bench storage is more difficult to reach. While ideal for bulk storage like roll materials, sheets, and literature, it is not ergonomically efficient space. Items that need to be viewed should not be stored below the table. It forces the worker to step back, bend over and awkwardly reach for material. These areas are prime storage for “B” and “C” items. Various carts, shelves, stands and other products are available to maximize the use of this space. Don’t forget the space over a conveyor. It is valuable. As you decide where to store each item, determine what kind of table component will be the most efficient. Modular type systems have advantages over custom designed stations because they are generally more flexible. Choose accessory storage that lets you store material in ergonomic reach zones. Final Packing Bench designs usually end up with compromises that make you choose between a series of desired features. If the bench is flexible you can experiment to test for the best solution. Contact Cisco-Eagle for fast assistance on your project.